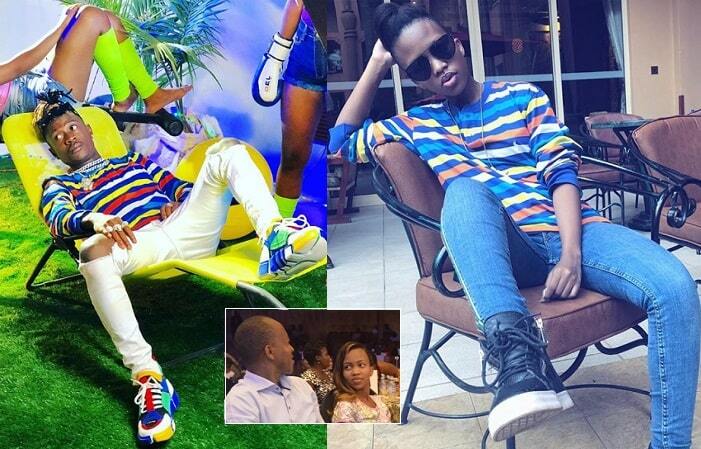 Could this be the reason behind Sheilah Gashumba's beating by the dad? Two weeks after donning Fik Fameica's long-sleeve T-shirt, she's not a happy gal! Those were the words the motivational speaker, Frank Gashumba, used while justifying why he had to discipline his daughter, Sheila Gashumba, who she thinks is derailing and it is better to put her in line than be sorry later. "Anyone can sire a child. That doesn't make you a father. It's the sacrifice and courage to raise a child that makes you a certified father. I raised Sheilah with no help from the Government or anyone for that matter. I have been (and continue to be) Sheila’s Father, Mother, and Manager! So no one on this planet knows her as well as I do!" These words come after social media trolls were on his case for lashing out at an adult even though she is still under his roof, but he says that "bean weevils" are trying to encroach on her. "My number one duty and assignment is to protect, guide and defend her from Kawukumi (bean weevils). Being a single parent teaches you a lot about parenthood that many people won’t understand. I am a very patient person & I give plenty of second chances, but I am no saint! However, that doesn’t mean that I don’t have my limits. There's a time to be a sweet daddy and there's a time to be tough!" Fik Fameica will be having his concert on December 14 at Kyadondo Rugby grounds and Sheila has been promoting that concert to the extent that even while on her Dubai holiday where she was hobnobbing with Hushpuppi, she did not forget to remind the Fik Fameica fans to turn up in large numbers. Does that lead to the beating? Yes and a No!. On September 18, Sheilah shared a pic putting on Fik Fameica's long sleeve T-shirt that he wore during the shooting of his 'Kwata Bukwasi' video featuring Eth, she captioned the pic as; "If I like it, I take it." This confirmed to many that have been having doubts between these two that they could be an item. Meanwhile, her fans on NTV the Beat are missing her as she has not worked for the whole week and on NTV's sister station, Spark TV, Frank Gashumba will be talking about what happened at about 11:30pm.